Audiology services are meant to help evaluation and diagnosis and hearing concerns you may be having. We are dedicated to providing quality hearing care along with the leading techniques and technology to help prevent hearing loss for you. Our treatment is designed to the individual, you, where we run comprehensive testing and diagnosis based on what you are experiencing. Evaluation is the first step to determining the state of your hearing loss. This is best tested for by a professional audiologist. Dr. Vazquez is a leading audiologist that works in the offices of Dr. Darius Kohan. The advanced testing methods used by our staff with let you know what is needed to improve your hearing. This can range from hearing aids to cochlear implants and more. 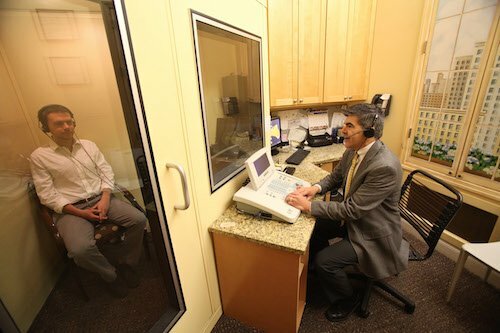 If you have any questions about the treatment and expectations of hearing tests/evaluations please call Dr. Kohan’s office for an appointment at (212) 472-1300.